ROCHESTER, Minn. — June 14, 2012. Mayo Clinic announced today that Lawrence W. and Marilyn W. Matteson of Moline, Ill., have given $10 million to help launch the Mayo Clinic Proton Beam Therapy Program. With this gift, Mayo Clinic will also use matching gift funds to establish the Lawrence W. and Marilyn W. Matteson Fund in Cancer Research. Mayo's Proton Beam Therapy Program will use the most advanced intensity-modulated technology known as pencil beam scanning, which few centers now use. Construction of the proton beam facilities in Rochester, Minn., and Phoenix, Ariz., are under way, and one of four gantries in the proton therapy facility being built in Rochester, Minn., will be named in their honor. The first treatment rooms will be available for patients in 2015 in Rochester, Minn., and in 2016 in Phoenix, Ariz. Unlike conventional radiation therapy, which can damage healthy tissue while it destroys the tumor, proton therapy delivers nearly its entire dose within the tumor, sparing healthy tissue surrounding the cancer. This form of therapy is especially vital in sensitive areas such as the brain and lungs and is especially useful for treating children, who are at higher risk for radiation damage because their bones and tissues are still growing. "Mr. Matteson is a grateful patient who has been very impressed with the care he received at Mayo Clinic," says Robert Foote, M.D.,chair of the Mayo Clinic Department of Radiation Oncology in Rochester Department of Radiation Oncology in Rochester. "Mr. and Mrs. Matteson wanted a way to show their gratitude and chose to donate funds that will help us ease the burden cancer has on patients, especially young children." "This gift is going to benefit children who are going through terrible cancers to not have the residual effects they would have with regular treatment," said Mrs. Matteson. "The side effects won't be something that follows them for the rest of their lives." The Mattesons generously supported The Campaign for Mayo Clinic, a successful $1.3 billion fundraising initiative that concluded in 2009. Mr. Matteson and his son, Larry, of Burlington, Iowa, are the founders of L.W. Matteson, Inc., a marine construction and dredging company in Burlington. The company maintained one of the largest fleets of dredging and marine construction equipment on the Mississippi River. The company was sold in 2010. Mr. Matteson and his son maintain ownership of Matteson Marine, which operates switch boats on the Mississippi. Mrs. Matteson is retired from John Deere. The Mayo Matching Gift Program recognizes that endowment of priority programs is critical for the future. In 2005 Mayo Clinic's Board of Trustees created a matching gift program to build and enhance specific endowments representing Mayo's highest research priorities. 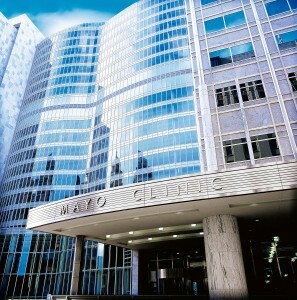 Mayo Clinic will match the annual spendable income from specific endowment gifts. Very few institutions of higher education are able and willing to match their benefactors philanthropic giving in this way. As a leading institution funded by the National Cancer Institute, Mayo Clinic Cancer Center conducts basic, clinical and population science research, translating discoveries into improved methods for prevention, diagnosis, prognosis and therapy. For information on cancer clinical trials call 507-538-7623.